Building on the industry-standard spreadsheet, Analyse-it integrates into Microsoft Excel to provide you with a wide-range of statistics and charts for visualizing, describing and testing hypotheses. Supporting the latest CLSI and industry-recognised protocols, Analyse-it lets you meet CLIA, CAP, JCAHO & ICH-Q2A/B analytical method validation requirements to validate, verify & demonstrate analytical accuracy, precision, linearity, recovery, reference intervals, and diagnostic performance. IVD companies can validate performance during development or when compiling final analytical performance claims for regulatory compliance. Researchers can verify methods meet the manufacturer's analytical and diagnostic performance claims. Laboratories can demonstrate performance of a new method to meet CLIA requirements, or demonstrate performance is back on track after a proficiency test failure. Easy-to-use data-entry templates for use by laboratory staff. Accurate & reliable, avoiding tedious, error-prone hand calculations. Print-ready reports, easily distributed to key laboratory staff by e-mail. Runs as an add-in to Microsoft Excel, so there's virtually no learning curve. A proven product, cited in hundreds of peer-reviewed papers over the last 10 years. 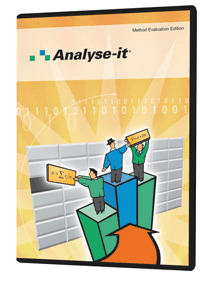 Includes all the statistics from the Analyse-it Standard edition. Why learn how to use a complex statistics package? 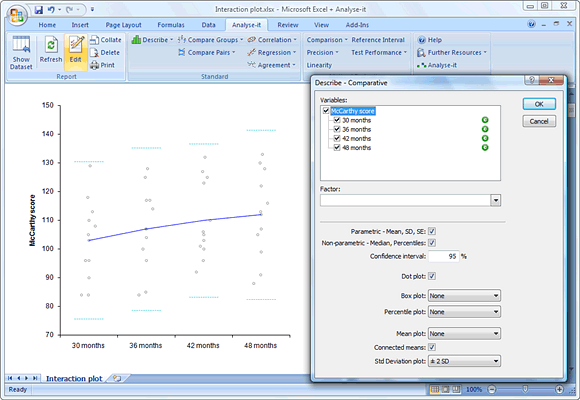 Analyse-it integrates into Excel ’97 to 2010 and provides a toolbar of dataset management and statistical tests so you can analyse data directly from your worksheet. Staying in the familiar Excel environment means there is virtually no learning curve!. You don't have to export your data to another package and you won't end up with your data locked into an in-accessible, proprietary, file format. Analyse-it integrates into Excel, providing a wide-range of statistics and charts for you to explore your data and test hypotheses -- all without leaving Excel. Analyse-it provides extensive descriptive statistics and insightful charts for exploring samples. Statistics include the mean, median & standard deviation, all with confidence intervals, plus many non-parametric measures such as quartiles & percentiles. box-whisker plots, mean-plots, percentile and standard deviation plots let you see how observations are distributed and spot outliers. A frequency histogram, with optional normal curve overlay, provides an alternative view of the sample distribution . Histogram bins can be determined automatically by Analyse-it or you can enter your preferred bins. Analyse-it provides many charts for exploring and visualising your data. Frequency histogram and dot- and box-whisker plot, with notch indicating median confidence interval, are shown. 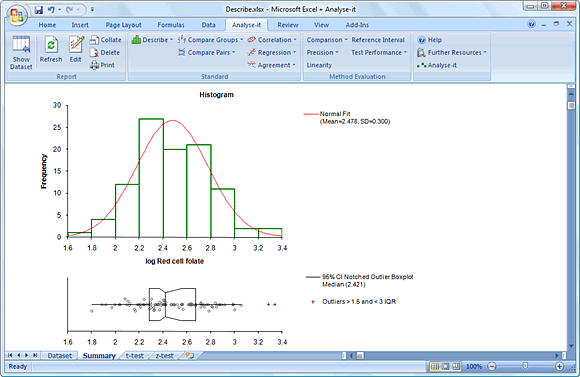 Tests and charts are included for verifying a sample is normally distributed -- a necessary step when using parametric statistics. Hypothesis tests are included so you can formally test normality, or you can use the normal quantile plot and frequency histogram (with normal overlay) to make a visual assessment. Parametric procedures including the t-test and ANOVA, with post-hoc comparisons, are provided so you can test whether groups/samples change due to a factor or over time. For non-normal and categorical data non-parametric procedures are provided, including Mann-Whitney, Kruskal-Wallis, Fisher exact, and Chi-Square. Side-by-side dot-plots, box-whisker plots, & mean-plots, let you visually compare samples. Interaction plots, with connected means, let you easily see whether samples or groups differ or change. Analyse-it interaction plot connecting means of four samples to show the change over time. Error bars of the mean /- 2 SDs (standard deviations) are also shown to see the variation. For bivariate data, Analyse-it lets you explore potential trends with Pearson, Spearman, and Kendall correlation, and compare categorical ratings with Chi-square & Kappa. Where definite trends exist, the variables predicting the response can be identified with multiple linear regression and polynomial regression. Goodness of fit statistics and residual plots tell you how well the chosen variables predict the response. The equation to predict future observations is also shown. 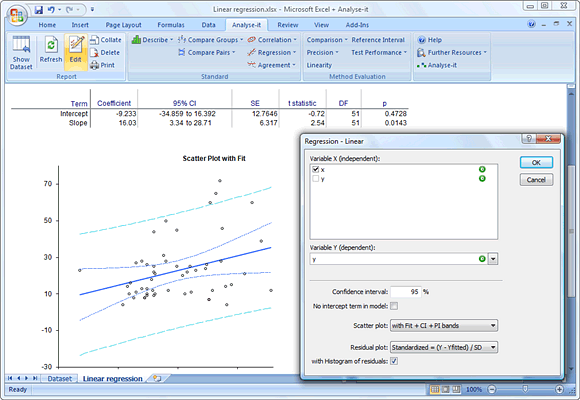 Analyse-it linear regression coefficients table and scatter plot showing the linear fit, confidence bands for the fit, and prediction bands.